A family favorite! This light Thai Noodle Soup recipe has a ton of flavor and comes together in under 25 minutes. Packed with shrimp and vegetables. This Thai Noodle Soup is one of those meals that earns me a “Yes!” plus fist pump when my kids ask what we’re having for dinner. And that is okay by me because this healthy dinner recipe has so many things going for it. First of all, Thai spices. If you’ve come across my Thai Chicken Salad (another favorite!) or Thai Chicken Naan Pizza, you already know that I’m a sucker for any dish that involves these flavors. 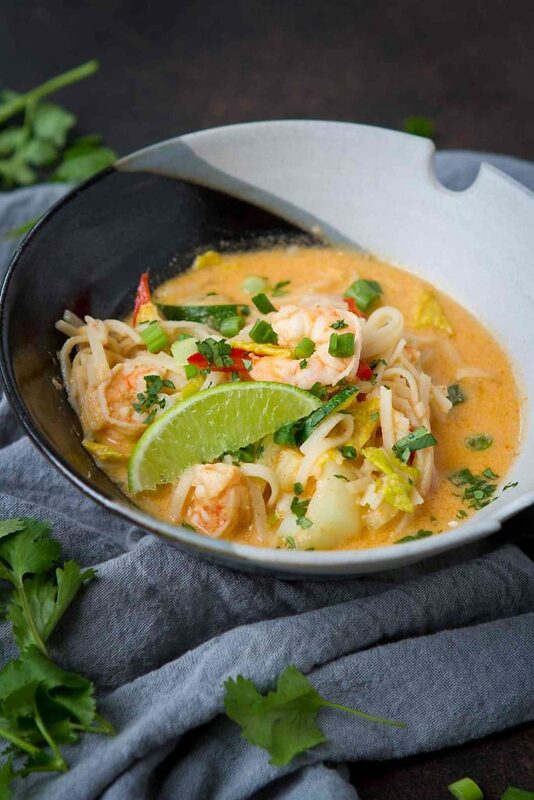 Second bonus point…this Thai Noodle Soup takes less than 25 minutes to make, plus it uses ingredients that I typically have in my fridge and pantry. Thai red curry paste stays good for awhile in the fridge, so even if you don’t make this again until two months from now, you won’t be wasting the curry paste. You can find it in the international section of most grocery stores or online. The brown rice noodles are a little more hit and miss. Sometime I’ll find them at a grocery store. If not, I order them online. If you prefer, you can use regular rice noodles as a substitute. 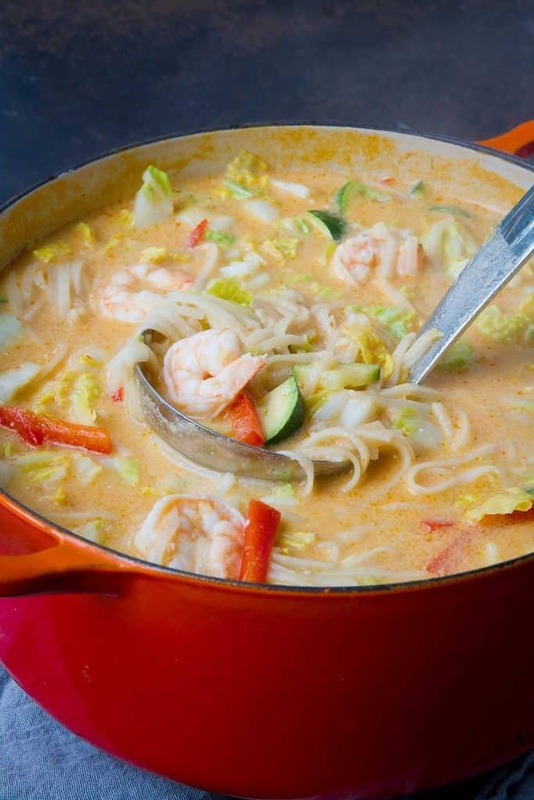 If you are following the new Weight Watchers Freestyle Smart Points plan, you already know that the shrimp count as zero points now, which drops the Smart Points by one for this recipe (see details at the bottom of the recipe below). But at the end of the day, it all comes down to flavor. And believe me, this soup has it! 1. 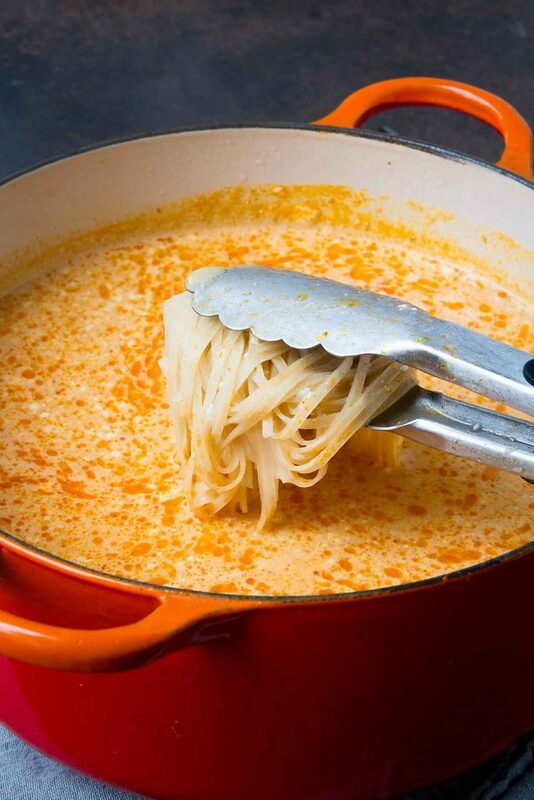 Melt the coconut oil in a large nonstick or cast iron saucepan set over medium-high heat. Add the garlic, curry paste and ginger. Cook, stirring frequently, for 2 to 3 minutes. 2. Stir in the coconut milk and chicken broth. Bring to a boil, then add the rice noodles and salt. Cook until the rice noodles are almost al dente, about 4 minutes. 3. Add the red bell pepper and zucchini, and cook until the zucchini is becoming tender, 2 to 3 minutes. 4. Add the shrimp and cook for 1 minute. Stir in the cabbage and cook for 1 additional minute. 5. Season with additional salt, if desired. Serve. *Additional salt not included in nutritional information. Made this tonight ad will be enjoying again because lots left over. It was delicious, I did add a bit and substituted a little but pretty much the same. I will make again for sure especially on another cold night. Hit the spot. This soup was so good! Only thing I didn’t have was coconut oil. Avocado oil was fine. I will make it again and again. A real keeper! Thanks Dara for you very good recipes. And only 8 points for dinner. This soup looks like it will hit the spot right now! Obsessed with Thai food! Sounds so good! I love coconut milk based soups! I always think of Thai food as being spicy but I think I need to try this one out!